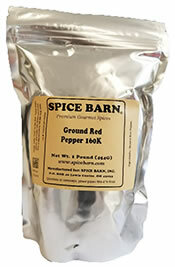 Description: Ground red chili pepper. Pungency: Bold, Beware. Very hot! Approximately 160,000 scoville heat units. Slice baguette and toast 5 minutes on each side. Mix all ingredients in food processor and spread mixture on toast. Bake at 350 10-15 minutes in pre-heated oven. Garnish with chopped chives or parsley. Cut bread into slices. Place on ungreased baking sheet. Whisk together oil, thyme, cayenne until blended. Brush over bread slices. Sprinkle with cheese. Bake at 300 degrees for 12-15 minutes or until bubbly. Preheat oven to 425 degrees. In a 9x9 baking dish, place bacon; top with Swiss cheese. Combine remaining ingredients and pour over cheese and bacon. Bake for 15 minutes. Reduce temperature to 300 and bake for 30 minutes. Combine all ingredients in a sauce pan. Heat slowly. DO NOT BOIL. Wonderful for grilled chicken! Heat 2 cups water to boiling. Add shallot and zests; blanch 3 minutes. Drain. Combine shallot-zest mixture, jelly, and spices in saucepan; heat over medium to boiling. Cook, uncovered, till jelly is smooth and mixture is well combined. Serve over chicken, ham, or game. Line a baking sheet with foil and spray with cooking spray. heat oil in a heavy skillet over medium heat. Add the spices and stir until fragrant, about 10 seconds. Add the sugar and stir until sugar melts and turn amber color. Remove from heat, stir in nuts until evenly coated. Spread on prepared sheet to cool and season with salt.